Enjoy the latest sale from John Hughes MG - NOWvember! †$24,990 is the driveaway price for the MG GS Core MY17 model including metallic paint (RRP $500) option. †Available at participating MG dealers. Ends 30/11/18. While stocks lasts. Not available to fleet, government or rental buyers, or with other offers. 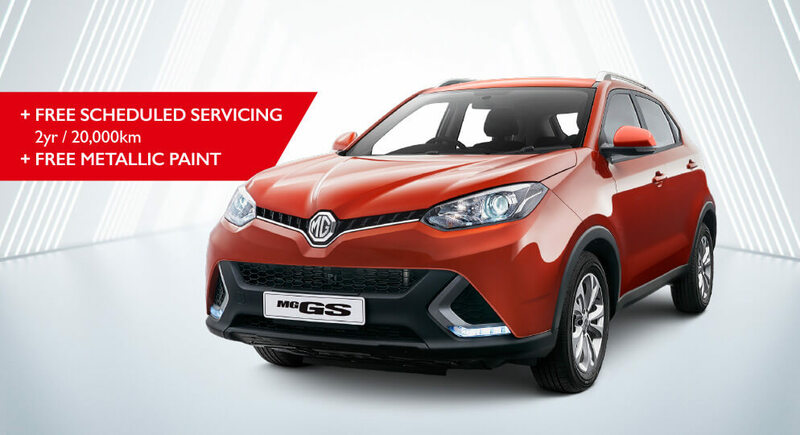 **Free scheduled servicing is for 2 years or 20,000kms (whichever occurs first) and applies to new MG GS Core MY17 model stock vehicles purchased and delivered from participating MG dealers between 1/11/2018 and 30/11/2018. While stock lasts. Excludes wear and tear items and any additional work or components required. Not available to fleet, government or rental buyers, or with other offers. ^Warranty and !roadside assistance T&C’s at www.mgmotor.com.au/warranty. Not available to fleet, gov’t, rental, hire car or chauffeur buyers. ∞ $15,990 is the driveaway price for MG3 Auto Core model (with no added options).∞ Ends 30/11/18. While stocks lasts. ^Warranty & !roadside assistance T&C’s at www.mgmotor.com.au/warranty. Not available to fleet, gov’t, rental, hire car or chauffeur buyers. MG Motor Australia reserve the right to change or extend these offers. 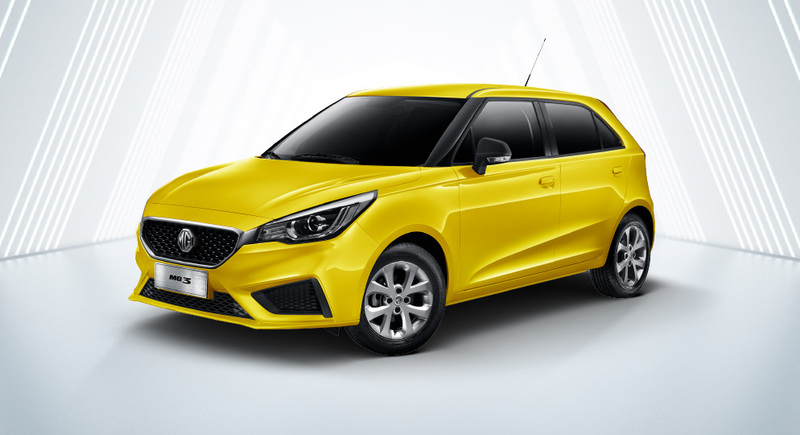 ∆$17,990 is the driveaway price for MG3 Auto Excite model (as shown). ∆ Ends 30/11/18. While stocks lasts. ^Warranty & !roadside assistance T&C’s at www.mgmotor.com.au/warranty. Not available to fleet, gov’t, rental, hire car or chauffeur buyers. MG Motor Australia reserve the right to change or extend these offers. *$22,990 is the driveaway price for the MG ZS Excite MY18 model (with no added options). ! !Free scheduled servicing is for 1 year or 10,000kms (whichever occurs First) and applies to new MG ZS MY18 stock vehicles. Excludes wear and tear items and any additional work or components required. ##200 BP Fuel Card available in respect of new MG ZS MY18 stock vehicles. Fuel card will be provided within 6 weeks of vehicle delivery. Not transferable or redeemable for cash. BP fuel card terms and conditions available at https://www.bp.com/en_au/australia/products-services/gift-card.html. ^^Free MG Accessories Pack containing MG Picnic Rug (RRP $53.94) and 2 x MG Hats (RRP $19.95) available for new MG ZS MY18 stock vehicles. *!! **##^^Available at participating MG dealers for eligible new stock vehicles purchased and delivered between 1/11/2018 and 30/11/2018. While stocks last. Not available to Fleet, government or rental buyers, or with other offers. ^Warranty & !roadside assistance T&Cs at www.mgmotor.com.au/warranty. Not available to Fleet, gov’t, rental, hire car or chauffeur buyers. ±$25,990 is the driveaway price for the MG ZS Essence MY18 model (with no added options). ! 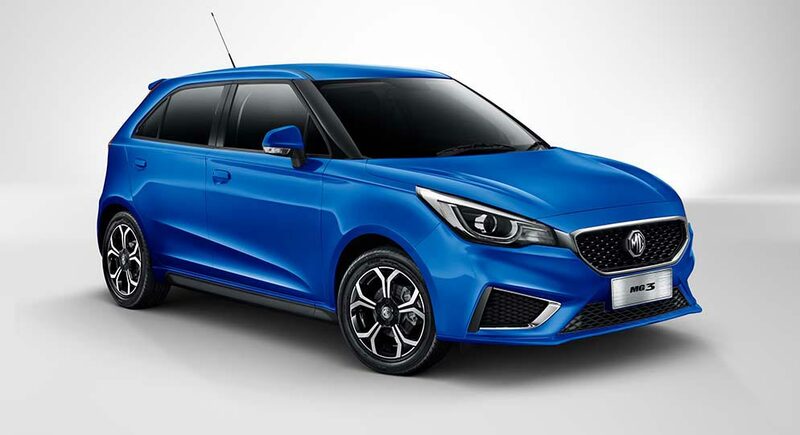 !Free scheduled servicing is for 1 year or 10,000kms (whichever occurs First) and applies to new MG ZS MY18 stock vehicles. Excludes wear and tear items and any additional work or components required. ##200 BP Fuel Card available in respect of new MG ZS MY18 stock vehicles. Fuel card will be provided within 6 weeks of vehicle delivery. Not transferable or redeemable for cash. BP fuel card terms and conditions available at https://www.bp.com/en_au/australia/products-services/gift-card.html. 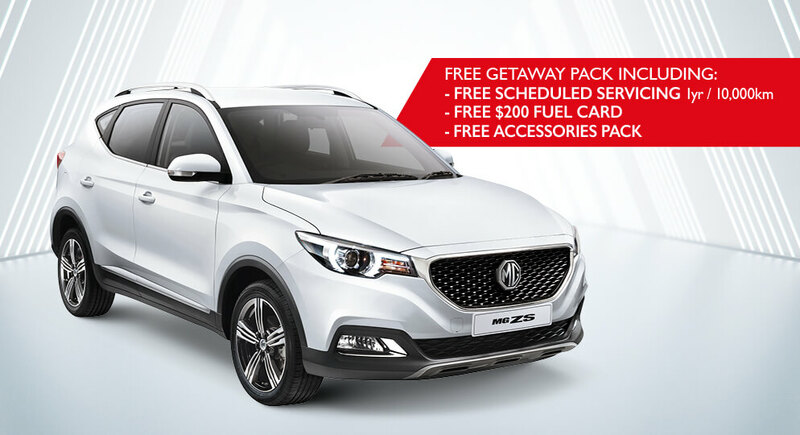 ^^Free MG Accessories Pack containing MG Picnic Rug (RRP $53.94) and 2 x MG Hats (RRP $19.95) available for new MG ZS MY18 stock vehicles. *!! **##^^Available at participating MG dealers for eligible new stock vehicles purchased and delivered between 1/11/2018 and 30/11/2018. While stocks last. Not available to Fleet, government or rental buyers, or with other offers. ^Warranty & !roadside assistance T&Cs at www.mgmotor.com.au/warranty. Not available to Fleet, gov’t, rental, hire car or chauffeur buyers. †$24,990 is the driveaway price for the MG GS Core MY17.5 model including metallic paint (RRP $500) option. Available at participating MG dealers. Ends 30/11/18. While stocks lasts. Not available to fleet, government or rental buyers, or with other offers. MG Motor Australia reserve the right to change or extend these offers. ^Warranty & !roadside assistance T&Cs at www.mgmotor.com.au/warranty. Not available to fleet, gov’t, rental, hire car or chauffeur buyers. 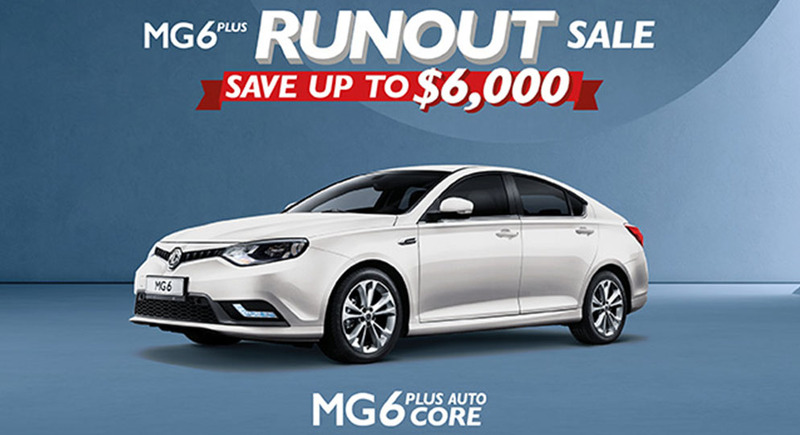 ~$17,990 is the driveaway price for MG6 Plus Core model excluding metallic paint (RRP $500) option. Available at participating MG dealers. Ends 30/11/18. While stocks lasts. Not available to fleet, government or rental buyers, or with other offers. MG Motor Australia reserve the right to change or extend these offers. ^Warranty & !roadside T&Cs at www.mgmotor.com.au/warranty. Not available to fleet, gov’t, rental, hire car or chauffeur buyers. *±†~ ∞ ∆ Available at participating MG dealers. Ends 30/11/18. While stocks lasts. Not available to fleet, government or rental buyers, or with other offers. MG Motor Australia reserve the right to change or extend these offers. ^Warranty & !roadside T&Cs at www.mgmotor.com.au/warranty. Not available to fleet, gov’t, rental, hire car or chauffeur buyers.